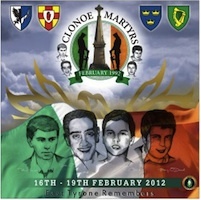 A commemorative march is to be held this weekend to recall the lives and deaths of the four men. Fresh details about how they were shot dead in the grounds of St Patrick’s Church at Clonoe in County Tyrone during the covert military operation have emerged on the 20th anniversary of their deaths. Some of the details include confirmation that 12 undercover soldiers, believed to be members of the SAS, took part in the secret operation. During the ambush, 514 rounds were fired at the IRA unit by undercover soldiers. The soldiers were dug into hedgerows around the church building, which went on fire after being struck by a bullet or flare. Eight cars, each containing two British soldiers, offered back-up to the undercover troops during the ambush. None of the shots fired during the incident have been attributed to the IRA men. Now the families of the four men -- Barry O’Donnell, Sean O’Farrell, and Peter Clancy, all from the Coalisland area, and Patrick Vincent from Dungannon -- have threatened to take legal action to force the Stormont administration to hold an inquest into their deaths. The four republicans were killed shortly after launching an attack on Coalisland RUC station on February 16 1992. One of the dead men, Sean O’Farrell, was stopped at a British army checkpoint close to the spot where he died just hours before the ambush and was allowed to continue on his journey. Over the past 20 years the families of all four men have been locked in a battle with authorities to force an inquest into the circumstances of the men’s deaths. Although a preliminary inquest has been heard a date for a full hearing has yet to be set. On the night they died the four IRA Volunteers attacked Coalisland RUC station and made the short trip to the church in the back of a stolen lorry. The Volunteers intended to dismantle their machine gun in the church grounds before leaving the scene. However, within seconds of arriving in the church car park the four, who were all members of the IRA’s east Tyrone brigade, were shot dead. Two other Coalisland men, Aidan McKeever and Martin Woods, were wounded. In the aftermath of the ambush, the British government said the deaths were justified, while former first minister Ian Paisley praised the killings. Controversy continued when 200 mourners walked out of the funeral Mass of Barry O’Donnell and Sean O’Farrell at the Church of the Holy Family in Coalisland when the local parish denounced the IRA leadership. Roisin Ui Mhuiri, the sister of Kevin Barry O’Donnell, said that the families’ campaign may have received some hostility because of their loved ones’ roles as IRA Volunteers. “People over the years, especially when it happened, did demonise them and said things that were hurtful to all the families,” she said. “They were our brothers and sons and it doesn’t make our grief any less because they were combatants or IRA men. Our grief is the same as anyone else’s and we feel the loss and we loved them. Mrs Ui Mhuiri said the British army ambush was a ‘shoot to kill’ operation. “There was no shoot-out. It was shoot to kill. There were over 500 bullets fired that night at these men and they never stood a chance,” she said. Mrs Ui Mhuiri said the families of the dead IRA men had not ruled out launching a judicial review to force authorities to hold an inquest. “There are already parents who have died and we need closure for this,” she said. Mrs Ui Mhuiri said the families believe they are entitled to the truth. “‘We are part of the solution too and we need our answers just like any other families that have been hurt or had someone injured or killed during this conflict,” she said. A weekend of events has been organised to remember the men. The anniversary weekend of events starts on Thursday 16th with Candle lighting at each grave; 6pm Clonoe, 6.30pm Coalisland at 7pm a torchlight procession at Edendork. On Friday 17th Memories of Barry, Patrick, Peter and Sean – a night of stories and music at 9pm in Clonoe Community Centre. On Sat 18th there will be Wreath laying ceremonies at each of the Volunteers graves beginning at Clonoe 2pm, Coalisland 2.30pm and Edendork 3pm. That evening at 7.30pm there will be an Inquest Discussion in association with Relatives for Justice, in the Cornmill, Coalisland. On Sunday 19th February, the National Commemoration will take place from Clonoe to Coalisland, assemble at Clonoe at 2pm. The organisers urged everyone to attend, although no party political emblems are to be carried. “Barry, Patrick, Peter and Sean’s story is one that must be remembered, it is a story of bravery, friendship and commitment,” they said.